Presidential election results map. 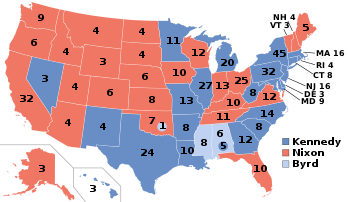 Blue denotes states won by Kennedy/Johnson, red denotes those won by Nixon/Lodge, orange denotes the electoral votes for Byrd/ Thurmond by Alabama and Mississippi unpledged electors, and a vote for Byrd/ Goldwater by an Oklahoma faithless elector. Numbers indicate the number of electoral votes allotted to each state. Kennedy won a 303 to 219 Electoral College victory, and is generally considered to have won the national popular vote by 112,827, a margin of 0.17 percent. The issue of the popular vote was complicated by the presence of several unpledged electors in the Deep South. Fourteen unpledged electors from Mississippi and Alabama cast their vote for Senator Harry F. Byrd, as did a faithless elector from Oklahoma. The 1960 presidential election was the closest election since 1916, and this closeness can be explained by a number of factors. Kennedy benefited from the economic recession of 1957–58, which hurt the standing of the incumbent Republican Party, and he had the advantage of 17 million more registered Democrats than Republicans. Furthermore, the new votes that Kennedy, the first Roman Catholic president, gained among Catholics almost neutralized the new votes Nixon gained among Protestants. Kennedy's campaigning skills decisively outmatched Nixon's, who wasted time and resources campaigning in all fifty states while Kennedy focused on campaigning in populous swing states. Nixon's emphasis on his experience carried little weight for most voters. Kennedy used his large, well-funded campaign organization to win the nomination, secure endorsements, and, with the aid of the big-city bosses, get out the vote in the big cities. Kennedy relied on Johnson to hold the South, and used television effectively. In 1963, Kennedy was assassinated and was succeeded by Johnson. Nixon would later successfully seek the presidency in 1968. The major candidates for the 1960 Democratic presidential nomination were John F. Kennedy, Governor Pat Brown of California, Senator Stuart Symington from Missouri, Senator Lyndon B. Johnson from Texas, former Illinois Governor Adlai Stevenson,  Senator Wayne Morse from Oregon, and Senator Hubert Humphrey from Minnesota. Several other candidates sought support in their home state or region as " favorite son" candidates without any realistic chance of winning the nomination. Symington, Stevenson, and Johnson all declined to campaign in the presidential primaries. While this reduced their potential delegate count going into the Democratic National Convention, each of these three candidates hoped that the other leading contenders would stumble in the primaries, thus causing the convention's delegates to choose him as a "compromise" candidate acceptable to all factions of the party. The next step was the primaries. Kennedy's Roman Catholic religion was an issue. Kennedy first challenged Minnesota Senator Hubert Humphrey in the Wisconsin primary and defeated him. Kennedy's attractive sisters, brothers, and wife Jacqueline combed the state looking for votes, leading Humphrey to complain that he "felt like an independent merchant competing against a chain store." However, some political experts argued that Kennedy's margin of victory had come almost entirely from Catholic areas, and thus Humphrey decided to continue the contest in the heavily Protestant state of West Virginia. The first televised debate of 1960 was held in West Virginia, and Kennedy outperformed Humphrey. Humphrey's campaign was low on funds and could not compete for advertising and other "get-out-the-vote" drives with Kennedy's well-financed and well-organized campaign. In the end, Kennedy defeated Humphrey with over 60% of the vote, and Humphrey ended his presidential campaign. West Virginia showed that Kennedy, a Catholic, could win in a heavily Protestant state. Although Kennedy had only competed in nine presidential primaries,  Kennedy's rivals, Johnson and Symington, failed to campaign in any primaries. 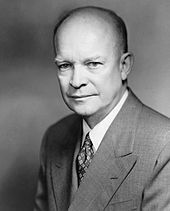 Even though Stevenson had twice been the Democratic Party's presidential candidate and retained a loyal following of liberals, his two landslide defeats to Republican Dwight Eisenhower led most party leaders and delegates to search for a "fresh face" who could win a national election. 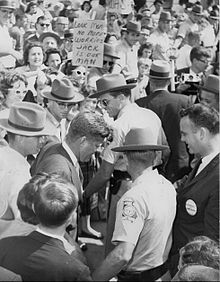 Following the primaries, Kennedy traveled around the nation speaking to state delegations and their leaders. As the Democratic Convention opened, Kennedy was far in the lead, but was still seen as being just short of the delegate total he needed to win. The 1960 Democratic National Convention was held in Los Angeles, California. In the week before the convention opened, Kennedy received two new challengers when Lyndon B. Johnson, the powerful Senate Majority Leader from Texas, and Adlai Stevenson, the party's nominee in 1952 and 1956, officially announced their candidacies (they had both privately been working for the nomination for some time). However, neither Johnson nor Stevenson was a match for the talented and highly efficient Kennedy campaign team led by Robert F. Kennedy. Johnson challenged Kennedy to a televised debate before a joint meeting of the Texas and Massachusetts delegations, to which Kennedy accepted. Most observers believed that Kennedy won the debate, and Johnson was unable to expand his delegate support beyond the South. Johnson received all 33 of Georgia's votes at the Democratic National Convention and was chosen by Georgia. Stevenson's failure to launch his candidacy publicly until the week of the convention meant that many liberal delegates who might have supported him were already pledged to Kennedy, and Stevenson—despite the energetic support of former First Lady Eleanor Roosevelt—could not break their allegiance. Kennedy won the nomination on the first ballot. During the campaign, Kennedy charged that under Eisenhower and the Republicans the nation had fallen behind the Soviet Union in the Cold War, both militarily and economically, and that as president he would "get America moving again." The Eisenhower administration had established NASA in 1958, but Kennedy believed that the Republican Party had ignored the need to catch up to the Soviet Union in the Space Race. He promised that the new Democratic administration would fully appreciate the importance of space accomplishments for the national security and international prestige of the United States. Nixon responded that, if elected, he would continue the "peace and prosperity" that Eisenhower had brought the nation in the 1950s. Nixon also argued that with the nation engaged in the Cold War with the Soviets, that Kennedy was too young and inexperienced to be trusted with the presidency - Nixon was only four years older than Kennedy. Had Nixon been elected, at 48 years, 11 days, he would have been the fourth-youngest president at the date of inauguration. Kennedy, by contrast, was 43 years, 236 days, on the date of his inauguration; the second-youngest man to begin a Presidency (at 42 Theodore Roosevelt, who assumed the Presidency upon the assassination of President William McKinley 60 years previously, was the youngest). Despite the reservations Robert Kennedy had about Johnson's nomination, choosing Johnson as Kennedy's running mate proved to be a masterstroke. Johnson vigorously campaigned for Kennedy and was instrumental in helping the Democrats to carry several Southern states skeptical of him, especially Johnson's home state of Texas. Johnson made a "last-minute change of plans and scheduled two 12-minute whistlestop speeches in Georgia". One of these visits included stopping in Atlanta to speak from the rear of a train at Terminal Station. On the other hand, Ambassador Lodge, Nixon's running mate, ran a lethargic campaign and made several mistakes that hurt Nixon. Among them was a pledge—not approved by Nixon—that as president, Nixon would name a Black person to his cabinet. The remark offended many Blacks who saw it as a clumsy attempt to win their votes. However, up to 20,000,000 fewer viewers watched the three remaining debates than the first. Political observers at the time felt that Kennedy won the first debate,  Nixon won the second  and third debates,  while the fourth debate,  which was seen as the strongest performance by both men, was a draw. A sample of how close the election was can be seen in California, Nixon's home state. Kennedy seemed to have carried the state by 37,000 votes when all of the voting precincts reported, but when the absentee ballots were counted a week later, Nixon came from behind to win the state by 36,000 votes. Similarly, in Hawaii, it appeared as though Nixon had won there (it was actually called for him early Wednesday morning), but in a recount, Kennedy was able to come from behind and win the state by an extremely narrow margin of 115 votes. In the national popular vote, Kennedy beat Nixon by less than two tenths of one percentage point (0.17%)—the closest popular-vote margin of the 20th century. 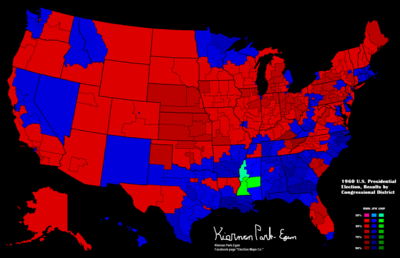 In the Electoral College, Kennedy's victory was larger, as he took 303 electoral votes to Nixon's 219; 269 were needed to win. A total of 15 electors—eight from Mississippi, six from Alabama, and one from Oklahoma—refused to vote for either Kennedy or Nixon. Instead, they cast their votes for Senator Harry F. Byrd of Virginia, a conservative Democrat, even though he had not been a candidate for president. Kennedy carried 12 states by three percentage points or less, while Nixon won six by similarly narrow margins. Kennedy carried all but three states in the populous Northeast, and he also carried the large states of Michigan, Illinois, and Missouri in the Midwest. With Lyndon Johnson's help, he also carried most of the South, including the large states of North Carolina, Georgia, and Texas. 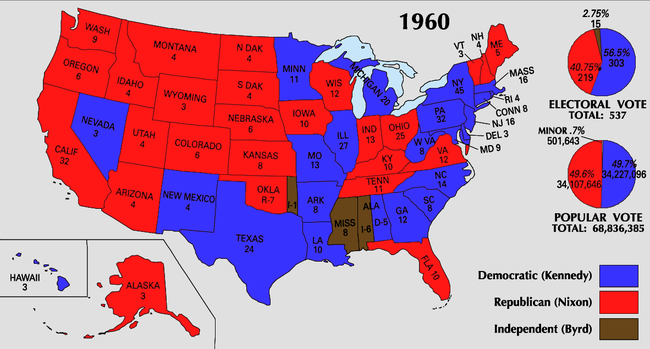 Nixon carried all but three of the Western states (including California), and he ran strong in the farm belt states, where his biggest victory was in Ohio. Nixon's campaign staff urged him to pursue recounts and challenge the validity of Kennedy's victory in several states, especially in Illinois, Missouri, and New Jersey, where large majorities in Catholic precincts handed Kennedy the election. However, Nixon gave a speech three days after the election stating that he would not contest the election. The Republican National Chairman, Senator Thruston Ballard Morton of Kentucky, visited Key Biscayne, Florida, where Nixon had taken his family for a vacation, and pushed for a recount. Morton did challenge the results in 11 states,  keeping challenges in the courts into the summer of 1961; however, the only result of these challenges was the loss of Hawaii to Kennedy on a recount. However, a special prosecutor assigned to the case brought charges against 650 people, which did not result in convictions. Three Chicago election workers were convicted of voter fraud in 1962 and served short terms in jail. Mazo, the Herald-Tribune reporter, later said that he "found names of the dead who had voted in Chicago, along with 56 people from one house." He found cases of Republican voter fraud in southern Illinois, but said that the totals "did not match the Chicago fraud he found." After Mazo had published four parts of an intended 12-part voter fraud series documenting his findings, which was re-published nationally, he said, "Nixon requested his publisher stop the rest of the series so as to prevent a constitutional crisis." Nevertheless, the Chicago Tribune (which routinely endorsed GOP presidential candidates, including Nixon in 1960, 1968 and 1972) wrote that "the election of November 8 was characterized by such gross and palpable fraud as to justify the conclusion that [Nixon] was deprived of victory." Had Nixon won both Illinois and Texas, he would have ended up with exactly 270 electoral votes and the presidency, with or without a victory in the popular vote. Many conservative Southern Democrats were opposed to the national Democratic Party's liberal platform on supporting civil rights and voting rights for African Americans living in the South. 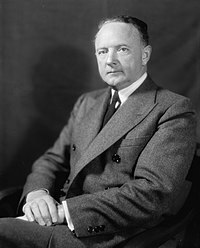 There was a call from segregationists for electoral votes to be withheld or to be cast to Harry F. Byrd, an independent candidate. Both before and after the convention, they attempted to put unpledged Democratic electors on their states' ballots in the hopes of influencing the race: the existence of such electors might influence which candidate would be chosen by the national convention, and, in a close race, such electors might be in a position to extract concessions from either the Democratic or Republican presidential candidates in return for their electoral votes. This was the first election where the winning candidate received a majority of the electoral votes although the second-place candidate carried a majority of the states. As of 2016 [update], it has happened once more, in 1976. Although the vote in both Alaska and Hawaii was very close in 1960, the election would foreshadow their future political leanings: Alaska has continued supporting Republicans in all but one election since ( 1964), while Hawaii has been carried by Democrats in all but two subsequent elections ( 1972 and 1984). ^ May, Ann Mari (1990). "President Eisenhower, Economic Policy, and the 1960 Presidential Election". Journal of Economic History. 50 (2): 417–427. doi: 10.1017/s0022050700036536. JSTOR 2123282. ^ "Nixon's Experience? (Kennedy, 1960)". The Living Room Candidate. Museum of the Moving Image. Retrieved 25 August 2016. ^ a b c d e "John F. Kennedy: Speech by Senator John F. Kennedy, the Little White House, Warm Springs, GA". www.presidency.ucsb.edu. Retrieved 2017-03-01. ^ a b c d e "CPD: 1960 Debates". www.debates.org. Retrieved 2019-01-08. ^ Campbell, W. Joseph (24 September 2016), " Debate myth emerges anew", Media Myth Alert. ^ Vancil, David L. (1987). "The myth of viewer‐listener disagreement in the first Kennedy‐Nixon debate". Central States Speech Journal. 38: 16–27. doi: 10.1080/10510978709368226. ^ "President Kennedy's Letter to Georgia Governor Ernest Vandiver, October 26, 1960 - John F. Kennedy Presidential Library & Museum". www.jfklibrary.org. Retrieved 2017-03-01. ^ Middleton, Russell (March 1962). "The Civil Rights Issue And Presidential Voting Among Southern Negroes And Whites". Social Forces. 40 (3): 209–215. doi: 10.2307/2573630. JSTOR 2573630. ^ Beschloss, Michael (2016-10-29). "No Concession, No Sleep: Glued to the TV on Election Night 1960". The New York Times. ISSN 0362-4331. Retrieved 2019-01-28. ^ Novotny, Patrick (2004). "John F. Kennedy, the 1960 Election, and Georgia's Unpledged Electors in the Electoral College". Georgia Historical Quarterly. 88 (3): 375–397. Retrieved 15 February 2018. ^ a b His tanned appearance was likely darkening ( hyperpigmentation) of the skin due to Addison's disease. O'Brien, Michael. John F. Kennedy: A Biography (2005), pp. 407–408.